A website devoted to the rediscovery of the works of early 20th century illustrator Henry E. Vallely (1881-1950). Perhaps best known for his chiaroscuro technique employed in Big Little Books, he also produced a large volume of work including fashion illustrations for women's magazines, spot illustrations for food periodicals, magazine covers and children's books. His art is distinctive and timeless and deserves the recognition that has until this time eluded it. Comments and contributions towards the preservation of the H. E. Vallely legacy are most welcome. All images are believed to be in the public domain unless otherwise noted. 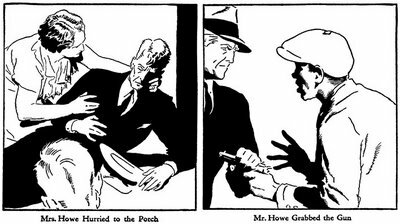 Today we return to 1938s Gang Busters In Action (BLB 1451) and two panels (pages 57 and 49) which it's safe to say were somewhat influential to the Batman mythos. 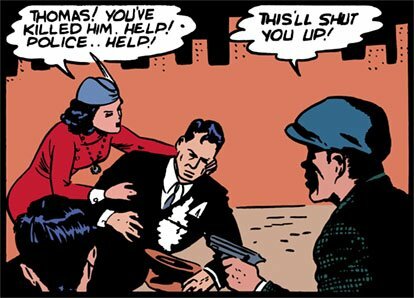 The bottom panel is again from Detective Comics #33 (November, 1939) which was the first appearance of Batman's origin. For years Bob Kane was given sole credit for the art, but in the recently released Batman Chronicles Volume One he finally shares credit with Sheldon Moldoff on inks. Careful observers will note that the same pose of the killer (Joe Chill) made an earlier appearance in Detective Comics #27 (May, 1939) on the second page, bottom, middle panel. For that issue Bob Kane maintains sole art credit. To this day Henry E. Vallely receives none. Arlen Schumer wrote a fascinating article Story: The Tale of Bob Kane’s Darknight Detective That ‘Could Have Been’” examining Kane’s own account of how he created the first image of Batman, using a “swipe” from an Alex Raymond Flash Gordon figure. The issue also includes an article by Schumer refuting Kane’s assertion of sole authorship of Batman, and interviews with artist Sheldon Moldoff (who was Bob Kane’s primary ghost artist from 1953 through 1968) and Fred Finger, the son of the late Bill Finger, Batman’s co-creator. Oh. There we go. Part 2. Much better. NOW...I am far more credulous. But these illustrations seem so generic, so simply done, it's not hard to imagine two creators coming up with generally the same rough dark figures. Nope. I'd have to see more. Oh jeez - yet another iconic Batman image swiped. If you reveal that the final panel ("And thus is born this weird figure ...") was stolen - and the wonderful strangeness of the pose suggests that it might well have been - I'm gonna have to shoot myself. how many of these books were actually made? Are they rare or should they be at all of the antique book stores? I followed a link from Ye Olde Comick Booke Blogge--these side-by-side comparisons are real eye-openers! I followed a link from Ye Olde Comick Booke Blogge--these side-by-side comparisons are real eye-openers. anonymous, I can't say how many of these books were originally produced but they aren't especially rare these days, unless you are seeking a mint copy. Time and weather are not kind to the pulp paper these books were printed on so expect to find the pages anywhere from yellow to brown and possibly on the brittle side. It's not too hard to find them on eBay or used book stores with prices ranging (depending on condition) from $10 to $75. This blog is optimized for viewing with Mozilla Firefox. All images on this blog have been scanned, restored and archived with great effort and expense. They are all copyrighted (unless otherwise noted) by the owner of this blog and may not be used or copied for any purpose or medium without the express written consent of the owner of this blog.